We present 2016 data in a household income percentile calculator for the United States. Our data comes from the Annual Social and Economic Supplement (ASEC) survey from the 2016 Current Population Survey, just like our last calculators for 2016 overall income percentiles and income percentiles by age. As the data was collected in March 2016, it represents full year (January to December) 2015 income data. This is the first year we have done this calculation for households. For individual incomes or individual incomes by age, please use the above links. We also have (2013) net worth by age, which is a household calculation. Miriam King, Steven Ruggles, J. Trent Alexander, Sarah Flood, Katie Genadek, Matthew B. Schroeder, Brandon Trampe, and Rebecca Vick. Integrated Public Use Microdata Series, Current Population Survey: Version 3.0. [Machine-readable database]. Minneapolis: University of Minnesota, 2010. 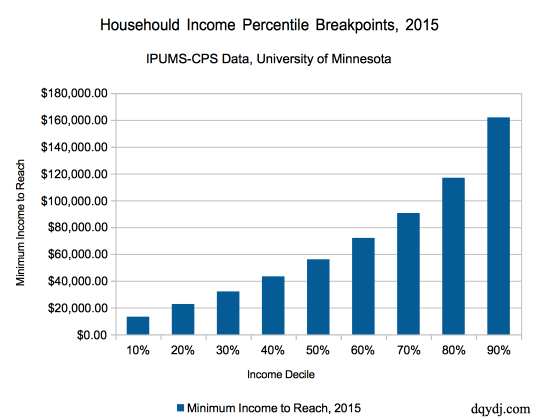 The University of Minnesota’s Population Center does a lot of value-add to the data we’re using; you can get it here: IPUMS-CPS. There is no methodological magic to this calculator, households are a straight dump of the available household data. There were 69,484 household data points in the available data, representing 126,067,600 households. How Does Your Household Income Percentile Data Compare to The Census’s Data? Technically, we are working from the same dataset, however our estimates will be slightly lower than the numbers the census has released. That’s because our public use data is both sanitized and top-coded. Quit simply, that means that responses which are easily identifiable are removed from the dataset, while incomes are set to a maximum. And, as you can imagine, affluent households are easier to identify (and more likely to be removed), while the ones that remain hit the topcodes. How does that affect the household income calculators? Very slightly – but measurably. It’s fair to say that, even with top-coding and sanitation, our numbers are pretty close. Feel free to disagree – but without access to the full dataset, we won’t be able to come closer. What Are Some Household Income Percentiles? We’ve run the numbers for the decile income breakpoints to quiet some of your statistical urges. To reiterate: this is the minimum household income required to be in each income decile. In many ways, household income is more interesting than individual incomes. In the case of multiple workers in a household (Millennials moving home, anyone? ), combined resources means a better lifestyle. It also means you see interesting takes on the substitution and income effects across various members of the household – or a tradeoff in non-leisure household duties. But hey, we’ve got a calculator now! Let us know what you see, and enjoy the household income percentile calculator. What is the minimum and average amount ncome for .001%? Is this income after 401k deductions, healthcare premiums, etc. or gross income? Take a look through the INCTOT section from IPUMS-CPS, it will link you out to the complete methodology. The x percentile counts people from the bottom, while of the Top y% counts from the top, so y% = 100%- x%. Top 10% is 90 percentile, or $161915. Note that these are income brackets. You may be assuming asset brackets based on your example. Do you have the info for 2016 for households and individuals by quartiles? Thanks. Yes, the quartiles are part of the data above (and in the Individual calculator). Take the breakpoints at 25, 50, and 75 percentile. Note that these are for 2015 full-year data (Jan – Dec). 2016 will be released soon and we will build new calculators. Maybe interesting to get more granular and do a DTI comparison? We have a post on the correlation of income and net worth you might like.